Oh Rose & Dan, was there anything not to love about this wedding?! It was just beautiful in every way imaginable… From the emotion and excitement while getting ready, to the extremely touching ceremony on Clearwater Beach that was so incredible family-centric and touching, there wasn’t a dry eye on the beach. 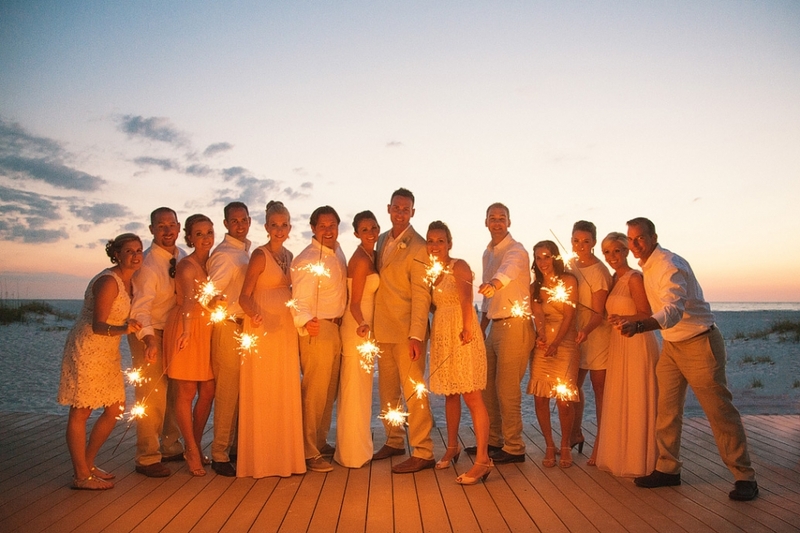 And if that wasn’t already amazing enough, when you say, “Sparklers at sunset!” we say “YES PLEASE!” So go check out all the gorgeousness of Rose & Dan’s oh-so-happy wedding at the Sand Pearl, we just can’t get enough of it! I’m definitely into the mix-and-match bridesmaid dresses, very unique! What a touching moment between Rose and her father. What did I tell you, not a dry eye on the beach! I love the kids barefoot sandals that match Rose’s, what a great idea! Cheers to a very successful ceremony! I love it when this happens, gotta love a playful wedding party! It’s definitely not a rough day when you hang around ladies as beautiful as this! Too cute, what a great big brother! Absolutely love this shot, Clearwater Beach at Sunset is just the greatest. There’s never a bad time for sparklers, so much fun!